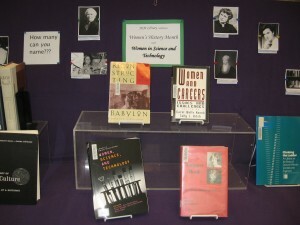 This year’s Women’s History Month book display focuses on women in Science and Technology. From autobiographies to biographies to anthologies to published works to primers on getting more girls and women involved in the sciences, we are celebrating women’s contributions and accomplishments. The Obama administration is committed to keeping girls on track and encouraging women to stay in the STEM fields: Science, Technology, Engineering, and Math. Women remain underrepresented in these fields even though they currently represent almost half of the workforce. Gender discrimination and social conditioning is often pointed to as a few of the reasons girls shy away from pursuing study in the STEM fields. The goal is to keep girls interested in the sciences and to provide support for them while they work their way through school and on to meaningful careers.